Ferry crossing to Calais, then a drive through Belgium to Holland’s Limburg province and the resort town of Valkenburg. 4 nights dinner, bed & breakfast at Hotel Walram. Visit the Dreilandenpunt, the tourist attraction and viewpoint near Aachen where the three countries of Holland, Belgium and Germany meet. Then to elegant Aachen to spend some time in the city of Charlemagne. We finish off an interesting day by going up into the Eifel hills to see the picture-book town of Monschau. 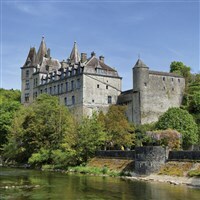 Belgium today with a look at Spa followed by a drive along well wooded valleys in the Ardennes to Durbuy, described as ‘the most perfect small town’. Return via Liège and alongside the River Meuse (which becomes the Maas in Holland). Short journey to Maastricht. One of the most picturesque and romantic cities in Holland, the blend of old and new is terrific. The Binnenstad is the main inner-city shopping centre; the Vrijthof is its best-known square - think of André Rieu’s concerts, and there are many parks and gardens to enjoy. There should be time for lunch and some sightseeing in the great French city of Lille on the way home. Ferry crossing from Calais back to Dover in early evening.